Just off the bustling highway a few minutes from town, hidden amongst the trees, cross the little wooden bridge to the entire private 2 bedroom paradise that is "Scenic Solitude." "Away from it all, yet near the center of everything!" This STUNNING, newly renovated home has an abundance of natural light and views. Upon entering the house you are welcomed into the huge open-plan kitchen/living area with a contemporary chef's kitchen, a large island for entertaining, bar stools, comfortable sofa and arm chair. The kitchen is fully equipped with granite counter tops, stainless steel appliances, keurig coffee maker, tea pot and toaster. If you want to be entertained, there is a 55'' Smart TV for your enjoyment, after a long day hiking or while preparing a sumptuous meal,or just chilling in the living room, looking out on to the Red Rocks. Step out onto the outside seated patio with gas barbecue grill and catch glimpses of the spectacular Sedona sunrises and sunsets. Travelers often come to this part of the world to explore and to enjoy the serenity and magic of this natural landscape. You will feel relaxed and rejuvenated after a couple of hours in your surroundings and may discover you do not want to leave. Whether you are enjoying a quiet breakfast in the breakfast nook or relaxing in the morning sun on one of the adirondack chairs, dining outside on the patio or curled up in front of the television, you will be glad you stumbled upon this treasure. There are two tastefully decorated bedrooms, one with a full bed, one with a CalKing. Both bedrooms are beautifully appointed with artwork. The family style bathroom has a stunning walk-in shower and a large double vanity. The enitre space is fitted with custom tile and cozy rugs. A separate laundry room with washer/dryer is situated across from the bathroom. Don't miss this one! A stunning Sedona jewel. We supply freshly cleaned linens, bedding, and towels for all our guests. We also supply paper towels, toilet paper, laundry detergent, dish soap, dishwasher pods/soap, and hand soap. We also supply shampoo, conditioner, and body wash from a dispenser inside of the shower. Although often there will be a variety of condiments, coffee, etc., we cannot guarantee what will be available. Pets are considered, however we asked that you keep "4 on the floor" as we say in our house. Pets are not allowed on furniture or bedding. Also, please pick up after them outside. We allow one small to medium size dog. No vicious breeds. No other pets are permitted without Manager approval. Professionally managed by Kathryn Duncan, Designated Broker, at KD Prime Properties. Single level cottage style home, approximately 1150 sq ft. Private tree and rock-lined driveway access road. There is a driveway for vehicles with ample, free parking. Bathroom: shower, toilet, double sink vanity. 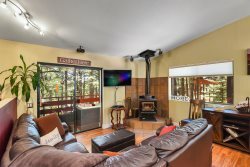 There is a large 55" Smart TV in the main living area with cable and streaming capabilities. Dining: There is a breakfast nook located off the kitchen (please see pictures). It has a table and seats 2. There are two additional bar stools at the kitchen island. Kitchen: The kitchen is equipped with gas stove and microwave, dishwasher, fridge freezer, Keurig Coffee maker and toaster. Pantry items: Pots and Pans. Outside seating/Patio: Front of house includes 2 adirondack chairs and lounger. Back outside dining area includes sofa, two chairs, coffee table, and a Char-Broil BBQ. Cable TV & Apps for Prime TV, Netflix, etc. Ample, free parking adjacent to home. There is another home on the property with residents. The two homes are about 200’ feet apart and separated trees and a lovely new bridge.